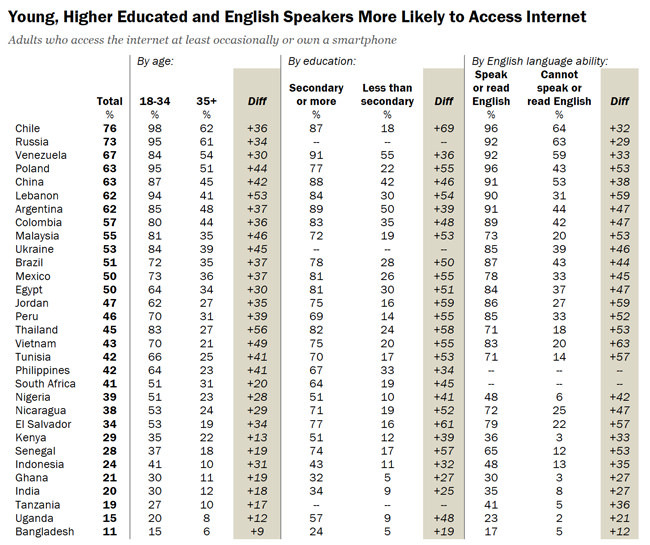 People in developing and emerging economies who are young and educated are much more likely to be Internet users. Ditto for those who speak a little English: regardless of age or education, they are more likely to be regular web surfers. These are some of the findings of the Pew Research Center’s 2014 Global Attitudes study. The study updates a similar effort from 2013, which highlighted the strong levels of web usage and engagement for social and mobile users. The findings for the 2014 edition are drawn from in-person interviews with 36,619 people across 32 emerging and developing countries conducted from March 17 to June 5, 2014. The results for those 32 countries – including significant education markets such as China, India, Nigeria, Indonesia, Thailand, Vietnam, Brazil, and Mexico – have been benchmarked against a related Pew Center telephone survey of 1,002 Americans, also conducted in 2014. The study’s high-level findings provide a compact overview of Internet access in developing and emerging economies, along with important insights as to how people access and use the Internet in each country. For example, the following graphic illustrates the percentage of the population in each country who access the Internet at least occasionally or own a smartphone (as smartphone users, practically speaking, are also Internet users). Do some of those numbers look lower than you would expect? If so, it is probably because you spend a lot of time talking to students. The Pew study points out that Internet usage is highly concentrated within younger demographics in developing and emerging economies, particularly among those with a high school education or higher and particularly among those who can speak or read English. Also echoing last year’s study, Pew finds that Internet users in developing and emerging economies are highly engaged socially. Staying in touch with friends and family and engagement with social media remain the leading ways in which they like to use the Internet. The Pew report also has some important observations in terms of how users in developing and emerging economies access the Internet. It tracks usage and ownership of desktop computers from country to country but also smartphone and cell phone penetration as well. The extent to which users in each country have reliable access to computers outside the home (e.g., at school or at work) is less clear. Leaving this aspect aside for a moment, we can see that computer ownership broadly correlates to national income levels and explains at least part of the relationship between Internet usage and income that we noted earlier. However, phone ownership again underscores the relationship between age and Internet usage. As with the broader correlation the study observes between these factors, smartphone ownership is also highly concentrated among younger users. “Young people (those under 35) are significantly more likely than their older counterparts to own an iPhone, BlackBerry, Android or other Internet-capable mobile phone,” says Pew. Overall, the study makes an important point that broader statistics of Internet penetration and usage in developing and emerging economies have to be interpreted via some important filters, including age, education, English ability, and income. In an international education context, the high school and college-age prospects that educators and agents are mainly trying to reach are among the heaviest users of web and mobile technologies. In this sense, the findings of the 2014 Pew study will only reinforce the importance of the Internet, and the social and mobile web in particular, as a key channel for reaching and engaging prospective students. This entry was posted in Africa, Argentina, Asia, Bangladesh, Brazil, Chile, China, Colombia, Egypt, Europe, Ghana, India, Indonesia, Kenya, Lebanon, Malaysia, Marketing, Mexico, Middle East, Nepal, Nigeria, North America, Peru, Philippines, Poland, Regions, Research, Russia, South & Central America, South Africa, Tanzania, Technology, Thailand, Uganda, Ukraine, United States, Venezuela, Vietnam, Youth Trends and tagged Uganda, Egypt, Ukraine, mobile apps, high schools abroad.